Pata Yamaha’s Alex Lowes added another podium to his WorldSBK record in race one at Chang, winning the only race he was realistically in, behind the fleeing Kawasaki and Ducati front-runners. Lowes was just over 14 seconds behind the winner, and thinks it could have been more. “I think if Alvaro did not make the mistake when he touched Jonathan, we would be 20 seconds behind again, like we were in Phillip Island,” said a brutally honest Lowes. “I felt like I rode a good race to be 15 seconds behind. It is incredible, and that is really disheartening but I have to be positive, and my battle is to try and race with the other Yamaha guys. It was a race with almost constant pressure from other riders for Lowes, and he eventually just beat his own team-mate, Michael van der Mark. “I had a few problems and I had plus zero on my board for 17 laps, so I was happy to not make any mistakes. It was good race for me and I am happy with the podium,” said Lowes. “For tomorrow, I think I can improve my pace a little bit and my feeling on the bike. I do not know where that is going to put me but I will try to get a good start in the sprint race and see if I can do a bit better than today. The ten lap race is a good opportunity to try and be a bit closer. 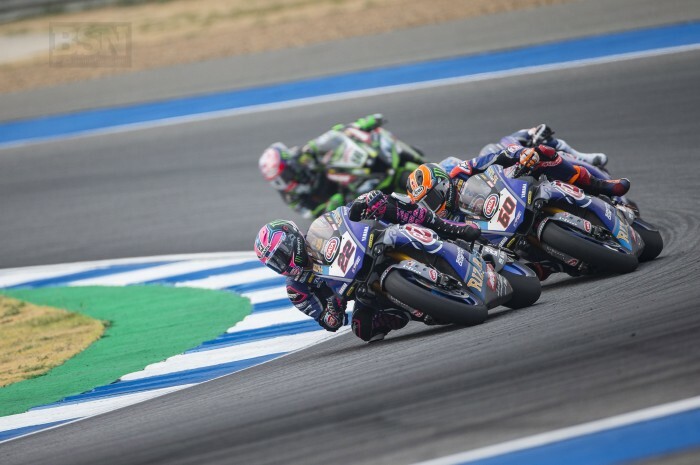 Lowes scored his 12th career podium, and his third Buriram podium, more than he has taken at any other track and rightly points out that he has scored at a variety of circuits, and his lone race win so far was at the hilly and geometric Brno. But he seems to like Buriram particularly. “If I look back at the last couple of years there have been a few tracks were I go good but there are just a few tracks that do not work so well for me,” said Lowes. “Qatar we are strong, in winter testing we were strong, PI wasn’t as strong, more to do with having the harder tyres there and not making them last. But I feel I have been riding quite strong at a lot of places. But, I like it here.